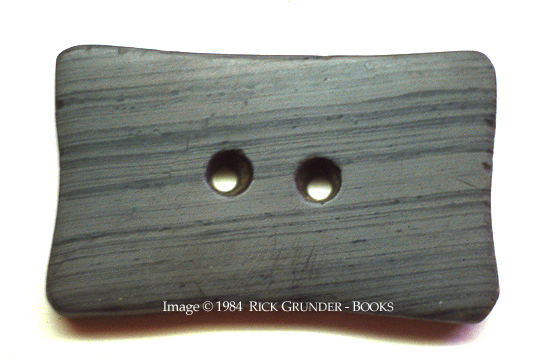 Native American gorget of polished grey green slate. 50 X 81 X 9 mm. Two small holes drilled. "As to how this Seer stone came into my possession, it has been handed down through one generation of the Whitmer family to the next generation until it finally was given to me, and I consider it a very great honor to have such a sacred trust in my possession." —Mayme Janetta Whitmer Koontz (1879-1961), daughter of John Christian Whitmer (1835-94), son of Jacob Whitmer (1800-56; brother to David Whitmer and brother-in-law to both Hiram Page and Oliver Cowdery): unpublished letter from Mayme Whitmer Koontz to Alvin R. Dyer, June 12, 1955, partially quoted by Alvin R. Dyer, The Refiner's Fire (2nd ed., SLC, 1968), pp. 257, 259. Dyer included an illustration of the present stone in his book (the photograph is small but sufficiently clear to identify the stone by the strata lines). See D. Michael Quinn, Early Mormonism and the Magic World View (revised and enlarged edition, SLC, 1998), 247-8 and Figure 13; History of the Church I:109-11, 115; Comprehensive History of the Church I:217-19; Ogden Kraut, Seers and Seer Stones [SLC,1983? ], pp. 50-53, with reversed illustration. The stone went to Mrs. Koontz's daughter, thence via David C. Martin to the vault of the Marine First National Bank, Janesville, Wisconsin, where it lay forgotten for a decade, and into my hands. It was owned by Steven F. Christensen from February, 1984, until shortly before he was murdered by Mark W. Hofmann; it remains in private hands.